I keep my eye on the ground all the time, including people’s yards and walks. Old homes favor local stone, for example, because it was quarried here at the time or maybe because people used to dig around their property more. People were more self-reliant in the past, too—the ability to do carpentry, tend animals and maintain buildings was more common. New homes all use imported stone, often lava rock from northeastern California that looks as foreign here as Carrara marble. Others favor mossy boulders that are ripped from a distant, anonymous hillside somewhere or perhaps even harvested illicitly from a national forest. No one certifies gravel, after all. But in this driveway panel at the top of Howe Street, these all look like local rocks, put together by someone who saved a pile of them just in case. If I owned my house I’d make something like it. Whoever created this didn’t drive down to American Soil Products and order a yard of pink flagstones first. This entry was posted on 14 October 2008 at 5:08 am and is filed under Oakland stone. You can follow any responses to this entry through the RSS 2.0 feed. You can leave a response, or trackback from your own site. I like it – a nice idea. All my rocks around the yard, however, are generally in piles! Wow I think that’s my driveway. You should come by and see the fence we have in the back yard. My landlady grew up in the house really sweet old lady and she told me her dad did all the work around the property and he was a bit eccentric. The fence has little buttresses and old bottles in it along with rocks from the area. Cool! That whole block has interesting old structures, plus the pair of columns next to the Chapel of the Chimes. The second picture on this post comes from your block too. 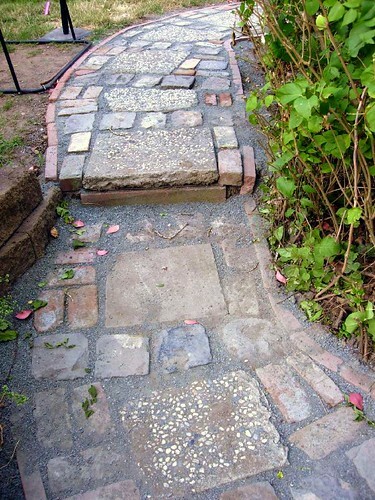 here’s a picture of a path i made in my yard using mostly rubble and old street cobbles i found in my yard in the fruitvale district. can you tell me where the local street cobbles were made and what they were made of? they are super hard and must have been difficult to make. also, i’ve found a bunch of very old black blocks which look like concrete but are much heavier – heavy as iron. i usually find them around the shoreline here in east oakland, but have found quite a few in alameda too. can you tell me anything about them? Pete, from your photo I’d guess that the square black stones are basalt blocks from the Round Top quarry, but that’s just a first guess. Funny that “Peter Veilleux” means “old rock” if you translate the Latin first name and the French surname.